Classification: Phylum: Monocotyledonae. Family: Arecaceae. 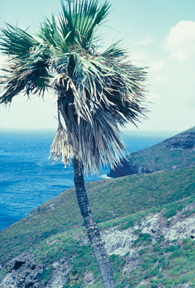 The Nihoa Fan Palm is known today from less than 700 individuals on the remote island of Nihoa. it once covered the entire island as the most dominant plant. it is thought that the former inhabitants of the island used the palm wood for making shelters and the fronds for thatching. a fire on the island in 1885 decimated the groves of palms but it is slowly making a comeback.